The Otatara Landcare Group has been managing a 14 hectare reserve at Bushy Point under an agreement with DOC since 2000. They have been restoring the grazed land into a self sustaining eco-system featuring ponds, native plants and fantastic birdlife. This outstanding community project aims to link the coastal fringe vegetation with the residual totara forest by re-vegetating the pasture separating the two. Much progress has been made and it has been exciting for Living Legends to be able to contribute to this project. 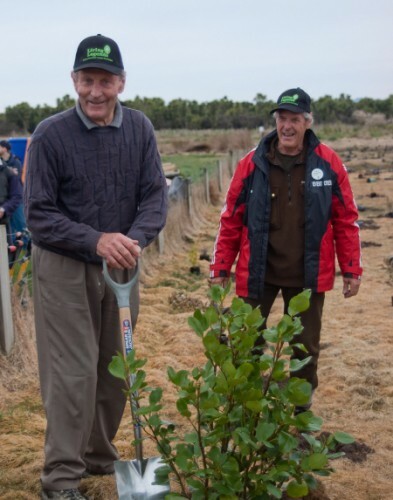 With the help of volunteers and Rugby Legend Kevin Laidlaw, Living Legends contributed an extra 11,380 native trees to Bushy Point. Management of the planting project at Bushy Point will now be handed over to the Department of Conservation and the Otatara Landcare Group. The Bushy Point restoration area on the Otatara peninsula near Invercargill has very significant natural values. The area has been quoted as having vegetation and habitats of indigenous fauna of national significance. It is home to the best remaining example of formerly more widespread coastal sand dune totara and totara – matai forests in New Zealand, and supports good populations of endemic forest birds including nationally threatened species that are strongly dependent on the forest remnants. It also contains nationally threatened plants as well as native fish species – kokopu, eels, and lizard species. Since 2000 the Otatara Landcare Group, has managed the Bushy Point Area organising many community planting days and managing weeds and animal pests over a wide area. With the help of Living Legends the project will progressively turn the area of grassland into a native forest. This future forest and wetland area has features and educational opportunities that can be enjoyed by the public of Otatara and Invercargill forever. The Otatara Landcare Group has also created a public walkway with interpretation signs and a self-guided leaflet which goes from the west end of Bryson Road around the estuary edge to the pond and forest restoration area where there is also a short forest loop walk. Anyone is free to enjoy this area at any time. 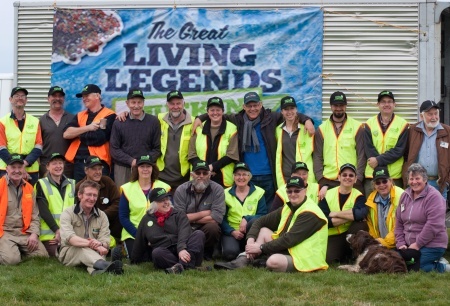 You can check out a video on Youtube that Otatara Landcare Group put together about Living Legends here. One of Southland rugby’s true legends of the game, Kevin Laidlaw, is thrilled to be the Southland Rugby Legend as part of the Living Legends project. “It’s a big honour”, says Mr Laidlaw. Born in the small coal-mining town of Nightcaps in 1934 Kevin played rugby for 34 years, his earliest memory playing at St Patrick’s convent school in 1942. He’s still involved in Southland Rugby now, serving on the Southland Rugby Union’s Board of Directors. A product of the celebrated rugby secondary school, St Kevin’s in Oamaru, Kevin played most of his rugby in Nightcaps, where he worked in a family garage. But it was from the Marist club in Invercargill that he first made the Southland representative side in 1956. He played at second five eighths for Southland against the Springboks that year scoring a try in the side’s 23-13 defeat. Laidlaw scored again for Southland in a big win over the Wallabies in 1958 and took a big step towards winning All Black honours in 1959. He played for Southland against the British Lions, his third appearance against a major touring side, was in the South Island side that year and then had an outstanding match when Southland lifted the Ranfurly Shield from Taranaki, a moment he says that was his best in his rugby career. That performance won him promotion to the All Black squad as a reserve for the fourth test against the Lions at Eden Park and good form in the trials early in 1960 confirmed him in the touring party. Laidlaw represented New Zealand in 17 All Blacks games, including 3 tests. He made his test debut for New Zealand against South Africa at Cape Town on July 23, 1960. His last test was also against South Africa, at Port Elizabeth on August 27, 1960. In the 1961 and 1962 seasons he brought his Southland tally of matches to 59 and in each played against touring sides in France and the Wallabies before retiring from playing. In the 1980s he returned to the Southland side as its coach and his son Paul, also a centre, had a lengthy representative career which in 1985 included an appearance for the South Island. He has been a stalwart of the Southland rugby scene as a player, coach and administrator and his advice to young people is to “join a club and be active – participate and administrate”. Which begs the question he asks himself, is there life after rugby? !